In February 2010, I wrote a blog article about wind-up toys or Jack in the Boxes. 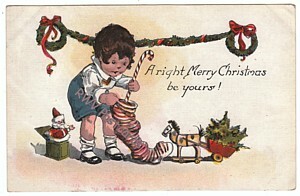 My illustration of this toy, on a vintage postcard, was in the form of Santa Claus. 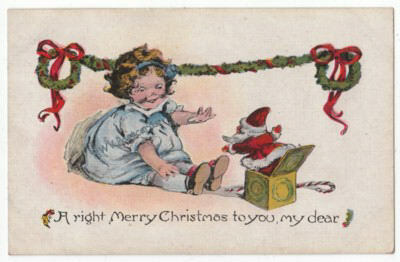 I was delighted when I found this vintage postcard, to have an unusual depiction of Santa Claus. I’m even more delighted now as I have found a second postcard in this series, no. 288. This second postcard didn’t provide any clue as to the age of this series, but it did yield other clues. 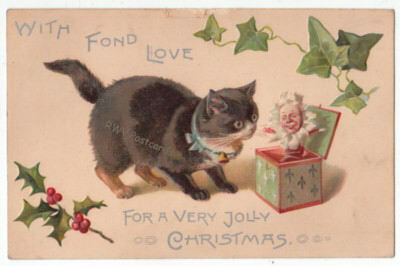 I now know each postcard in this series will most likely have a Santa in the Box, and a wreath garland shown at top plus long stemmed candy cane. I can’t wait to find the remaining four in this series!